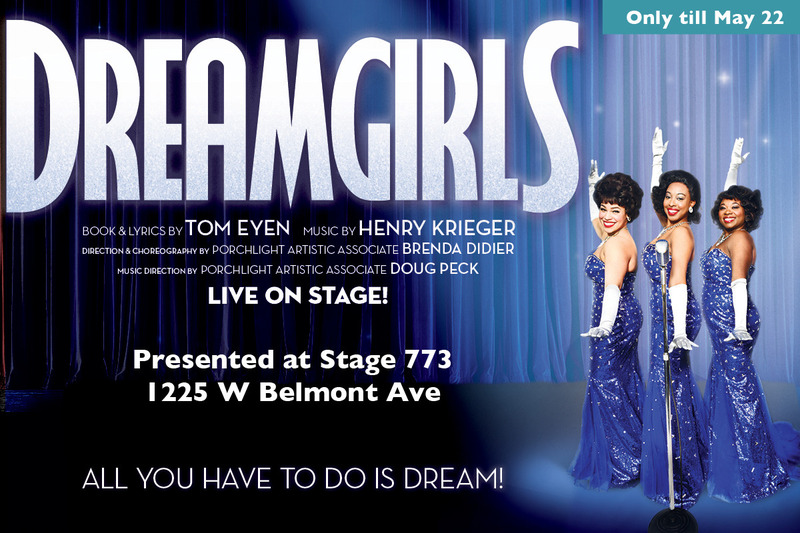 Porchlight Music Theatre and Artistic Director Michael Weber are proud to announce the extension and additional performances of Dreamgirls, book and lyrics by Tom Eyen, music by Henry Krieger. 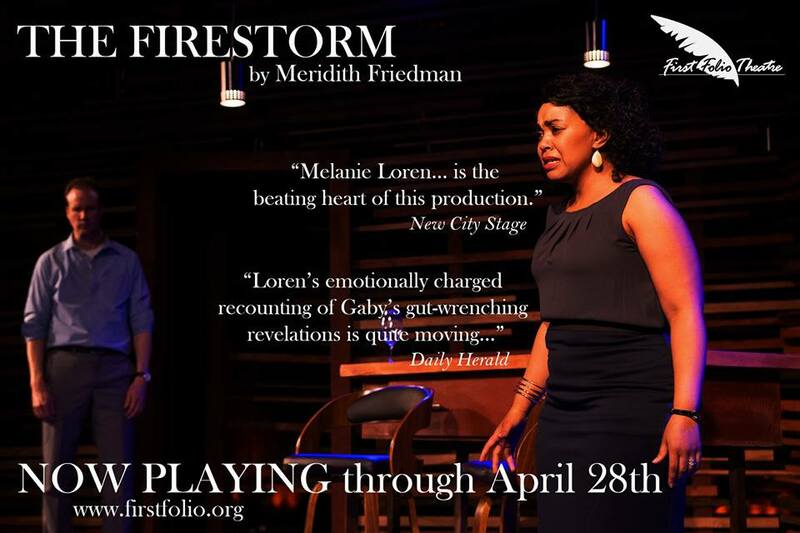 This production is directed and choreographed by Porchlight Artistic Associate Brenda Didier and music directed by Porchlight Artistic Associate Doug Peck, now through May 22. Regular performance times are Thursdays at 7:30 p.m., Fridays at 8 p.m., Saturdays at 4 and 8 p.m. and Sundays at 2 p.m. Added performances Thursday, May 5, 12 and 19 at 1:30 p.m. and Sunday, May 8 at 7 p.m. Single tickets may be purchased at porchlightmusictheatre.org or 773.327.5252. Groups of ten or more may receive discounts on tickets purchased via Group Theater Tix at 312.423.6612 or grouptheatertix.com. Full of on-stage joy and backstage drama, Dreamgirls is the story of an up-and-coming 1960s all-female singing group from Chicago and the triumphs and tribulations that come on the road to fame and fortune, and features unforgettable hits including, "And I Am Telling You I'm Not Going," "One Night Only" and "Listen." With a story that lives through the journey of popular music in America, and presented in Porchlight's signature intimate and up-close style, this Tony Award and Academy Award-winning musical will receive an intense and illuminating interpretation by Chicago’s leading talents. The full cast of Dreamgirls includes Caleb Baze (Cadillac Boy/Stage Manager), Michelle Bester (Ensemble), Dawn Bless (Ensemble), Kyrie Courter (Ensemble), Gilbert Domally (C.C. White), Jared Grant (Ensemble), Matthew Hunter (Ensemble), Reneisha Jenkins (Ensemble), J. Michael Jones (Marty), Eric Lewis (Jimmy Early), Andrew Malone (Ensemble), Brian Nelson Jr. (Ensemble), Trequon Tate (Ensemble) and Cherise Thomas (Ensemble). The Dreamgirls production team includes: Porchlight Artistic Associate Christopher Pazdernik (assistant director); Chris Carter (associate choreographer); Porchlight Artistic Associate Bill Morey (costume designer); Porchlight Artistic Associate Jeff Kmiec (co-scenic designer); Greg Pinsoneault (co-scenic designer); Denise Karczewski (lighting designer); Kevin Barthel (wig designer); Mealah Heidenreich (properties designer); Robert Hornbostel (sound designer), Sara Gammage (stage manager) and Porchlight Artistic Associate Aaron Shapiro (production manager). ABOUT PORCHLIGHT ARTISTIC ASSOCIATE BRENDA DIDER, director/choreographer Brenda Didier, recently named one of the “major musical theater forces” working in the Chicago area, is a multi-award-winning director/choreographer having received Joseph Jefferson Awards for both direction and choreography, After Dark Awards for choreography, the National Youth Theatre Award for choreography and the 2010 Broadway World Chicago Fan Favorite Award for choreography. Didier has collaborated with Porchlight Music Theatre on ten productions, most recently the return of the smash-hit Ain't Misbehavin' (Jeff Award Best Production and Direction) and A Funny Thing Happened on the Way to the Forum as well as How To Succeed in Business Without Really Trying, Pal Joey, Putting It Together, Ragtime and Once on this Island, all for which she received Jeff nominations. She has served as a guest instructor and choreographer for Northwestern University, Columbia College, the University of Illinois-Champaign/Urbana, the University of Wisconsin-Parkside and Carthage College. Didier has choreographed musicals, industrials, special events as well as productions for Second City's mainstage and five installments of Cirque Shanghai at Navy Pier's Skyline Stage the summers of 2007-2012. Didier is owner and director of the Lincolnshire Academy of Dance, now in its 16th successful season in its 5000 square foot facility. Doug Peck is one of Chicago’s leading music directors, having won six Joseph Jefferson Awards (The Jungle Book, Porgy and Bess, Caroline, or Change, Carousel, Fiorello! and Man of La Mancha) and two After Dark Awards (Guys and Dolls, Hello, Again), as well as the Sarah Siddons Award and the Guy Adkins Award, for his music direction and orchestrations in Chicago and across the country. 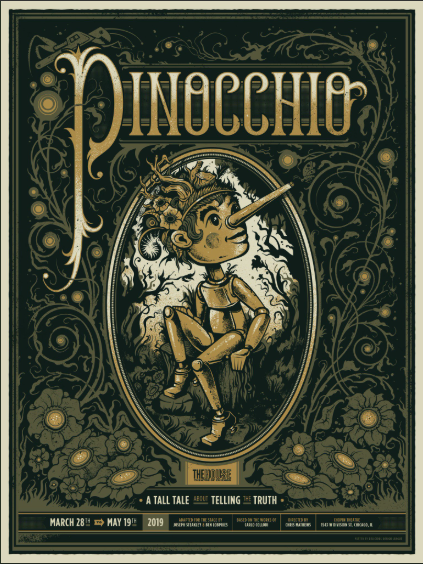 In addition to Porchlight, Peck’s work has been heard in Chicago at Court Theatre, Goodman Theatre, Chicago Shakespeare Theater, Writers Theatre, TimeLine Theatre Company, Northlight Theatre, Paramount Theatre, Drury Lane Oakbrook Terrace, TimeLine, Writers Theatre and the Ravinia Festival. Regional credits include work at Glimmerglass, the Huntington Theatre Company, the Shakespeare Theatre Company, Long Wharf Theatre, Asolo Repertory Theatre, Oregon Shakespeare Festival, Peninsula Players Theatre, among others. Peck can be heard on the recordings Bright Young People: The Songs of Noël Coward, Foiled Again Live and Loving Repeating: A Musical of Gertrude Stein. For the Chicago Humanities Festival and Porchlight’s annual Chicago Sings concerts, he and Rob Lindley have presented unique one night only events focusing on various aspects of the music world and performance. 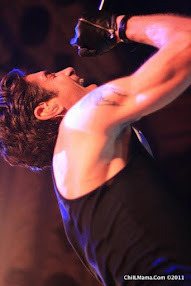 Peck is a graduate of Northwestern University and also trained at the Interlochen Center for the Arts. He is a creative partner with the Goodman and a faculty member of the National High School Institute of the Arts. Donica Lynn has appeared at many of the top-tier theatres in the Chicago area including, most recently, opposite Andre de Shields in Confessions of a P.I.M.P. at Victory Gardens as well as at The Goodman (Crowns and Ain’t Misbehavin’,) Court Theatre (Caroline or Change,) Drury Lane (Hairspray and Aida,) Marriott Theatre (Once on this Island and Suessical,) TimeLine (Fiorello,) The Mercury Theatre (The Color Purple and Barnum,) Chicago Opera Theatre (Queenie Pie,) Congo Square (Black Nativity and Santified,) and The Paramount (Hair). Dreamgirls marks Lynn’s Porchlight Music Theatre debut. Porchlight Music Theatre, now in its 21st season, is nationally recognized for developing innovative new works, reimagining classic productions and showcasing musical theatre’s noted veterans and rising stars. Porchlight elevates the genre in Chicago by providing intimate and powerful theatrical experiences for its growing and diverse audiences. With the vision of Artistic Director Michael Weber, Porchlight builds on its role as Chicago’s only Equity not-for-profit company exclusively specializing in works of theatre in which music is an essential element. Porchlight’s rich history includes the staging of more than 60 productions with 13 Chicago premieres and five world premieres. Through Porchlight’s “Off the Porch” new works program, the musicals of the next generation are developed and given a first audience. The School at Porchlight is Chicago’s center for music theatre training in the areas of performance, writing and appreciation. The company’s many accolades include 11 Black Theatre Alliance nominations and two awards, as well as a total of 115 Joseph Jefferson Award nominations resulting in 31 Jeff Awards, recently garnering three consecutive Best Production awards for Sondheim on Sondheim (2015), Ain’t Misbehavin’ (2014) and A Class Act (2013).